matrix printers have tiny pins that are mounted on the print head, which work with an ink ribbon to produce a series of dots that form the letters on the paper. They can often print in two colors, black and red, and are capable of printing graphics. Dot matrix printers usually range from $175 to $350. They are popular for kitchen environments, since kitchen temperatures are not optimal for thermal printers to work effectively. due to their improved print quality, faster speed, and quieter functioning. Thermal printers print by direct contact between the thermal head (which generates heat) and thermal paper (which is thermally coated to be sensitive to heat). Therefore thermal printers do not require ink or toner, and over time this helps to make up for the higher initial cost. More recent developments in thermal printing include multi-colored thermal printing, and double-sided printing for receipts. Ink jet printers have print heads that shoot tiny droplets of liquid ink onto the paper. They may worth considering if you want high quality, color logos, or coupons printed on your receipts, but the cost of replacing ink cartridges is substantial. Is the receipt printer compatible with your POS software? Most are, but it’s best to check with the software vendor before purchasing. Do you have or plan to implement a printer connected cash drawer? If so, you will need to make sure the receipt printer is compatible to the cash drawer. Changing paper rolls should be fast and easy, so you don’t ever have to keep customers waiting. 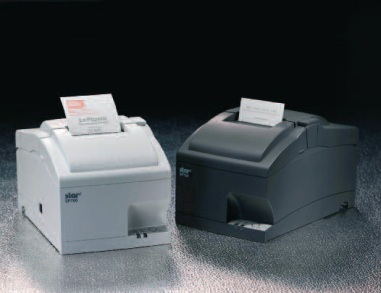 (Image, right: “Drop in and print paper load,” used with permission from Star Micronics). Budget. Receipt printers can cost as little as $175 and as much as $800. While budget is always a factor, make sure you invest wisely to accommodate your needs. How green is the receipt printer? Some companies make more of an effort to implement energy saving technology in their receipt printers, and also to reduce the amount of paper that is used in printing receipts. Both of these factors are not only more environmentally friendly, but can result in significant savings over time. Finally, issues of name brand, reliability, and warranty options are important considerations for making sure you get the most from your investment in a receipt printer. How to Computerize Your Small Business. New Yord: John Wiley & Sons Publishers, Inc. Aberle. (1995).